I posted this on Sailnet as I used some of the forums to help prepare for the move. In interest in not re-writing everything here, I'm just re-posting. The big update is that Atlas is back in the water, but now it is FRESH Water. Lake Superior. 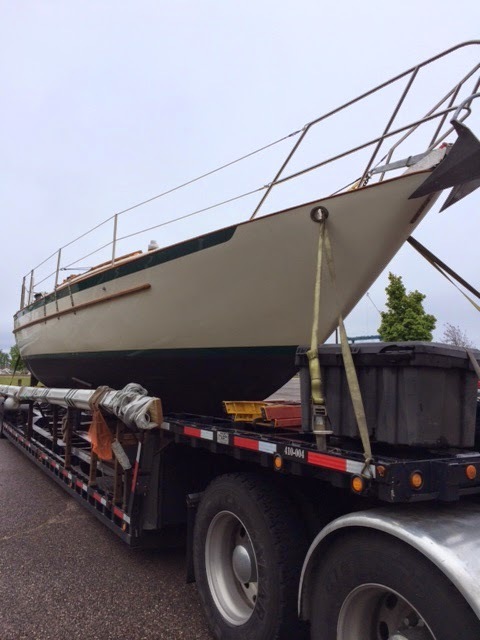 She is at a dock at the upper harbour in Marquette, might move to Ashland, but I'll keep you updated. Here is the update on the move…. 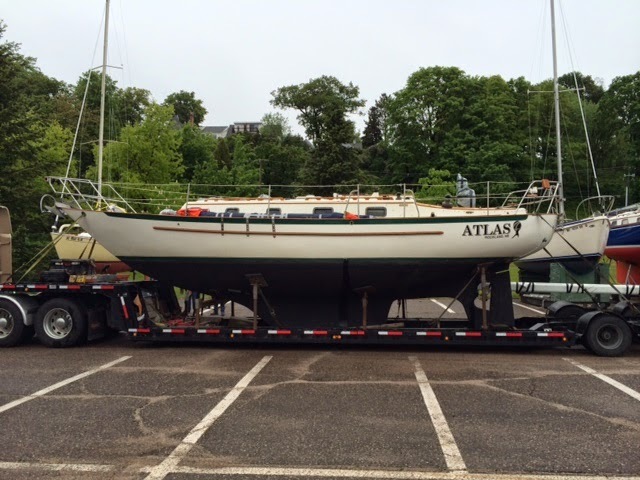 Atlas was moved to Marquette two weeks ago and put into lake superior! (Yea!) It was a little delayed due to ice on the lake, but nothing but blue water now... I figured I should write an update and tell how it went. First of all, the people that replied and gave me a ton of great information helped a ton. (THANK YOU!) I used a lot of the suggestions, and the move was a good success. No major (or even little that I've seen) damage, and everything went smooth. I flew to Rockland to prep the boat and pack everything. 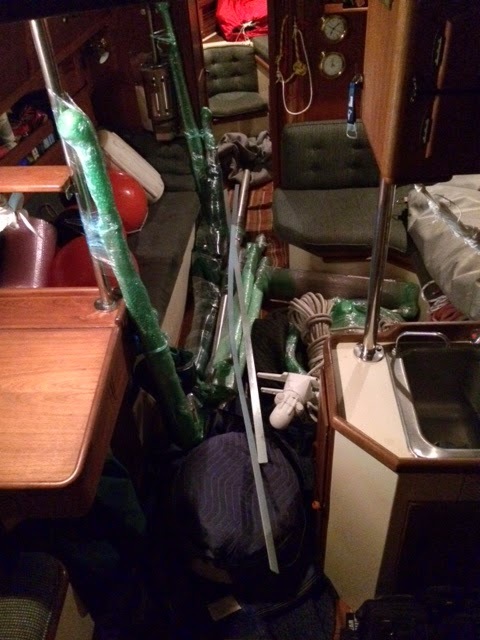 I also had a storage locker of stuff (sails, anchors, old rigging, etc…) that I didn't usually keep on the boat but wanted to pack into the cabin. The boat itself: Based on feedback I left the lifelines up and didn't shrink wrap. I did take down all the vents, and tape all the hatches. Everything arrived good here. I did use a little duct tape on the main forward hatch (on the metal) this was a pain to get off. 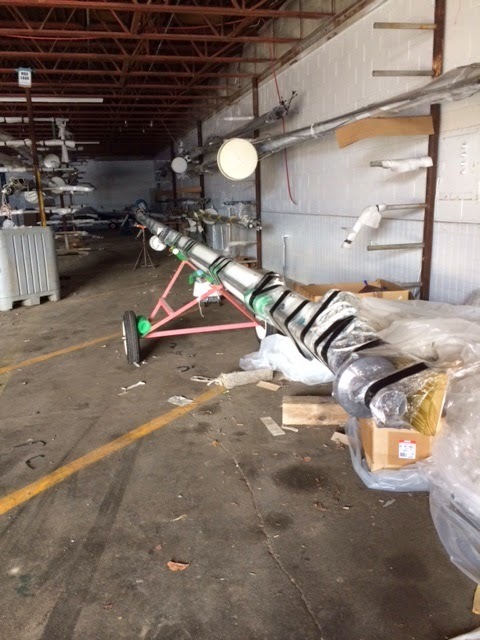 For the mast step with all the wires and hardware I first stretch wrapped it with packing plastic, then duct taped it. This worked great and came right off. For the instrument cluster at the helm and wheel I first left my canvas cover on. I used a 55 gallon plastic bag over it. It fit like a giant thing made out of latex that I won't mention here. The 55 gal bag had some lose spots so I used the packing plastic wrap to firm everything up and then duct taped the heck out of it. It came through with flying colours. Boom: I took the vang off and wrapped in bubble wrap to be stored down below. Most of the ropes and rigging I just left on (except the mainsheet) Everything was wrapped in moving blankets, plastic wrap, and duct tape. 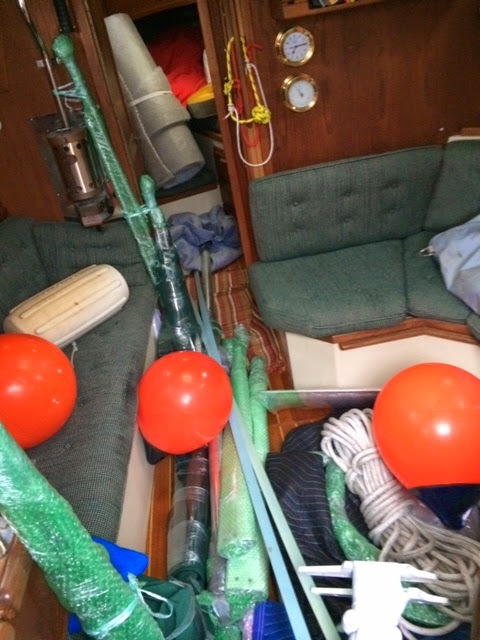 The boom ended up on the side deck of the boat resting on two life jackets and tied down. (More on that later) Everything arrived with no problems. Interior: I worked on the principal that everything will likely end up on the floor anyway, so my strategy was to put all of the heavy stuff in the middle of the floor wrapped in packing blankets and bubble wrap. The lighter stuff that didn't fit into cabinets all went on top of the heavy stuff. All the lockers were bungie corded shut, and packed to prevent movement. See the interior before and after pics. Most everything held together, the red floats moved from the bench to the floor (I figured they would) and the thing I was most worried about - the frame for the outside canvas, didn't move at all. They were wrapped to handholds with tape. Everything went really well and I'm really happy with the move. I used Journey's end trucking, and the driver was great! We did let the schedule slip a week. I'd contacted them twice by phone and e-mail to confirm the week two weeks before the move, the week I flew up to pack the boat (and the week it was supposed to move) they called an old cell phone number and didn't get me so the delayed the move. Partially my fault and no real damage done. I did want a picture of the boat leaving Maine… Other than that, Journeys end moving was really good. I did have some frustrations with the service group at the marina, and felt like I had to stay on top of them (and in front of their desk) on everything. The first year I had the boat there I gave them about $15K of winter work (electronics, some fb repairs, etc…) I signed off on the work in October. 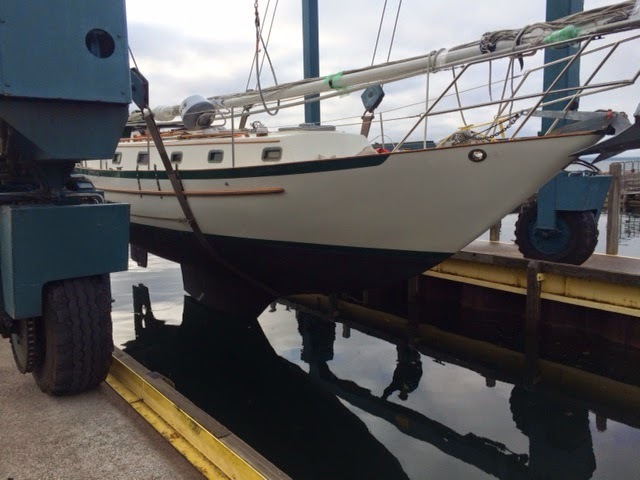 I scheduled the boat to go into the water in May, and took the week off to enjoy time on the boat. They said everything was going great, but when I arrived for my week on the boat they had only just started the work a few days before. I spent the entire week trying to get them to finish the boat so I could actually sailed it. The first half of the week I had to stay in a hotel as it was on the hard. I guess that is why you can't keep a schedule on a boat…. 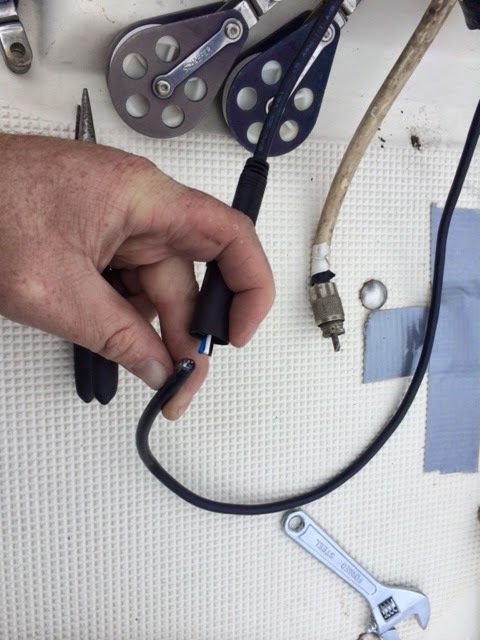 Other small things drove me crazy, when they took the mast off instead of undoing two plugs for the wind speed and radar, they just cut the wires. It took me 30 seconds to undo the plugs, and an hour to re-wire them… The dock staff at Journeys end and the showers, bathrooms and other facilities are great. Everyone is helpful, but if you are getting service done sometimes it feels like you have to yell to get to the top of the list and I hate that.